Kansas state law 65-1,248 protects a mother’s right to breastfeed any place she has the right to be. It also states it is Kansas public policy for mother’s choice to breastfeed be supported and encourage to the greatest extent possible. To order “Breastfeeding Welcome Here” materials in bulk, please contact Julie Fields at juliefieldslc@gmail.com . In Kansas, 80% of mothers initiate breastfeeding. These mothers are more likely to patronize businesses where they feel comfortable. Breastfeeding moms need all the support they can get. By taking the “Breastfeeding Welcome Here” pledge businesses agree to provide a welcoming environment where breastfeeding mothers are able to sit anywhere and enjoy a welcoming attitude from staff, management and other patrons while breastfeeding. The goal of this campaign is to encourage more women to breastfeed their babies and for a longer duration by assisting our communities to become more friendly toward breastfeeding families. The use of this symbol will alert moms to public locations where they can breastfeed comfortably and to encourage our communities to view breastfeeding as normal, accepted, and welcomed. The American Academy of Pediatrics recommends exclusive breastfeeding for six months and continued breastfeeding for a minimum of one year. The World Health Organization recommends breastfeeding for a minimum of two years. According to the American Academy of Pediatrics, the lack of support for breastfeeding is one of the obstacles to its success. If our culture embraces breastfeeding as the normal way to feed babies and young children, more women will breastfeed and the health statistics are likely to change for the better. Many Kansas businesses are already providing this level of access and comfort for their patrons. However, there are some businesses and employees that may be unaware of the current law. This can cause an awkward and embarrassing situation for the mother that is simply feeding her child. 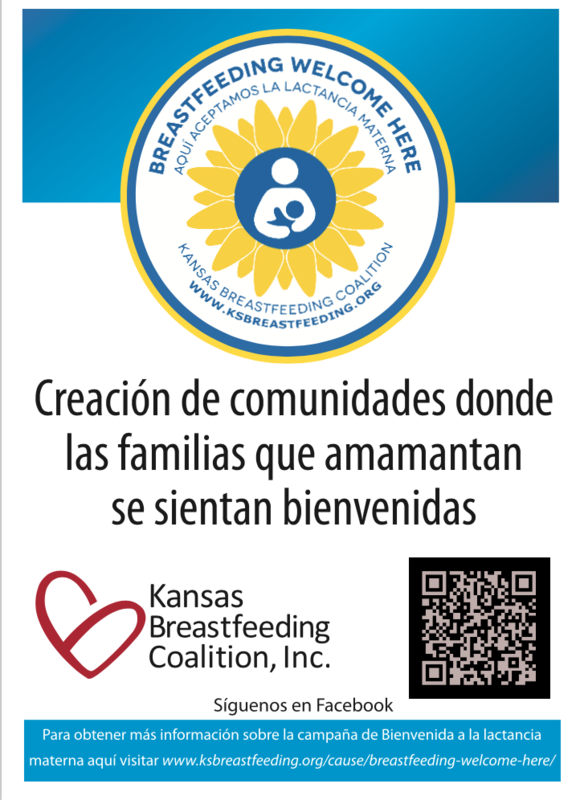 The campaign’s aim is for businesses to demonstrate their support for breastfeeding by making a commitment through a pledge, and then displaying a clearly visible English/Spanish bilingual window decal (English/Spanish table tents are also available). Yes. 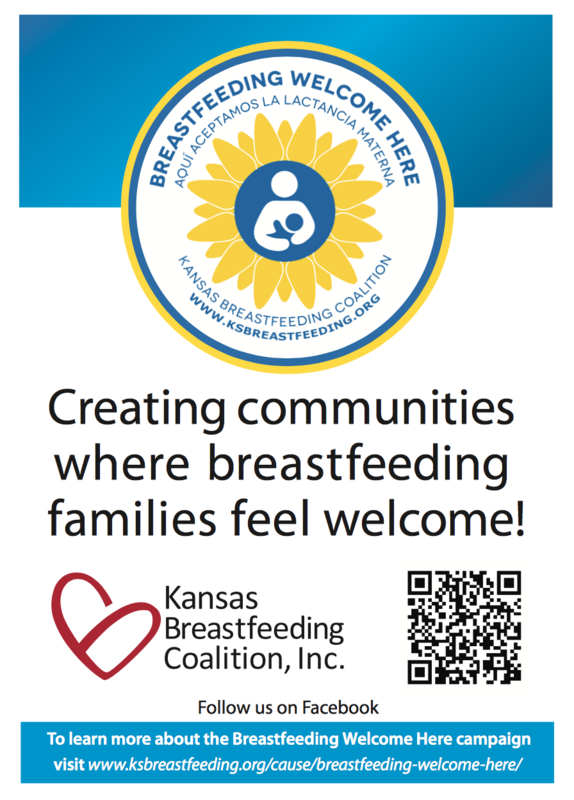 The Kansas law protects a mother’s right to breastfeed in any place that is open to the general public. This includes shopping venues, schools, restaurants, libraries and on public transportation. This law is, in part, based on feeding on cue- one of the key maternity care best practices. Feeding a baby on cue means that a mother is able to nourish and calm her hungry or upset baby. Because milk production works according to supply and demand, feeding on cue also means that mothers will be able to increase and sustain milk production for their growing baby. It is important to validate concerns as well as educate. This is an understandable concern. Supporting breastfeeding families actually means you will be supporting more families. The vast majority of women who are breastfeeding are very discreet. They simply want to feed their child without worrying about being scolded. The more your community is educated about breastfeeding, the more it will be perceived as a normal (rather than controversial) act. Yes, 80% of mothers initiate breastfeeding in Kansas. People don’t realize how often babies are breastfed in public because mothers and babies are so skilled at breastfeeding discreetly that it often doesn’t register with viewers. Yes! There are many barriers women face that prevent them from meeting their breastfeeding goals. However, mothers are more successful with breastfeeding when they have a supportive community where they live and work. Providing a comfortable, shame-free environment for breastfeeding mothers means that more families are able to have the freedom to be away from home and enjoy their communities. 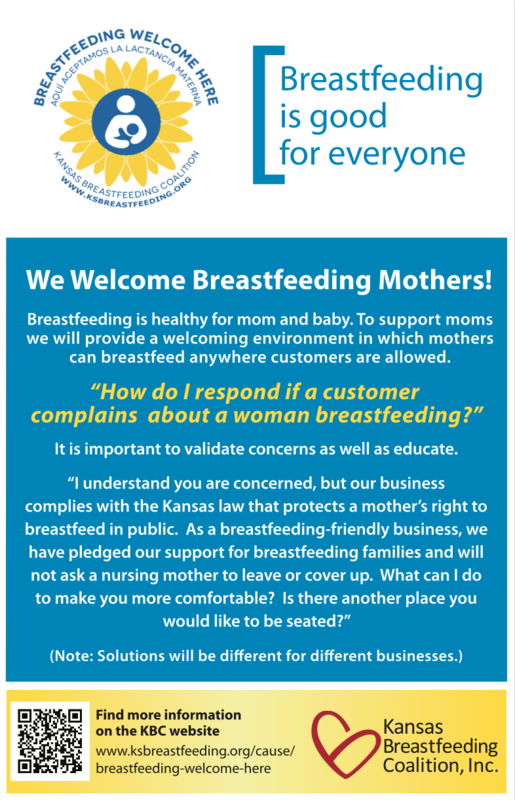 Kansas law states “[a] mother may breastfeed in any place she has a right to be.” Many Kansas businesses are already providing this level of access and comfort for their patrons. The campaign’s aim is for businesses to demonstrate their support for breastfeeding by displaying a clearly visible window cling. The National Conference of State Legislature website lists breastfeeding laws by state. *Click here to download an English PDF version of this staff education poster. *Click here to download a Spanish PDF version of this staff education poster. A well informed staff is critical to the support of breastfeeding patrons within an establishment. Clear guidelines minimize confusion or misinterpretation of expectations. Staff need to know why welcoming breastfeeding in public is important, and what is expected of them. The Frequently Asked Questions portion of this page gives a detailed rationale for staff to review.